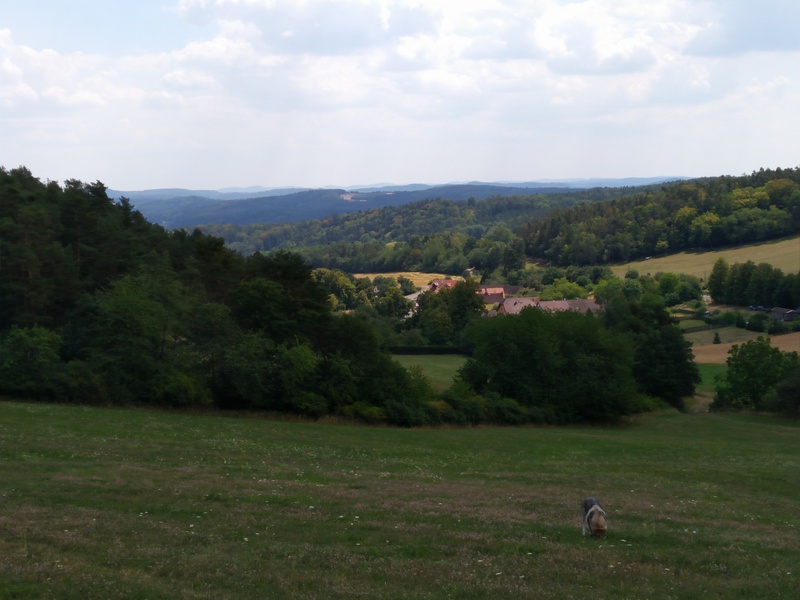 Blog posts about a writer’s holidays are normally dreary affairs of narcissism and fantasy. So, here’s one about why my holiday was wonderful, curious, and, well, heartbreaking. 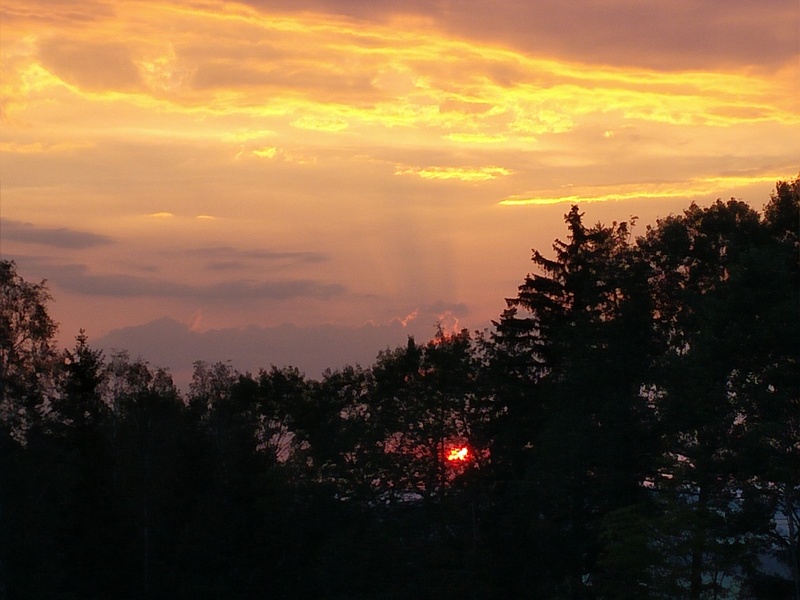 As this was my third visit to Krenicna, Central Bohemia, Czech Republic, perhaps the neighbours felt more familiar with me, because I was invited to join them at their social gatherings far more often than ever before. I got a chance to have substantial conversations with people who, on previous visits, I only met in passing. Anyone can go to a faraway country and gawk at the monuments that they could see in photographs at home; a real adventure involves talking to new people, for new people are always surprising, and often wonderful too. I shall be glad to see them again next year. It was, as always, wonderful to babysit the family dog, Helli– who, this year, was in heat– but maybe I’ll save those stories for the next time you meet me in person. You know, over the last six or seven years or so, my thinking has grown less mystical and more humanist. Most of my friends know this, or figured it out even if I didn’t say much about it. Readers of my books will have noticed I’m not writing (much) about paganism anymore. 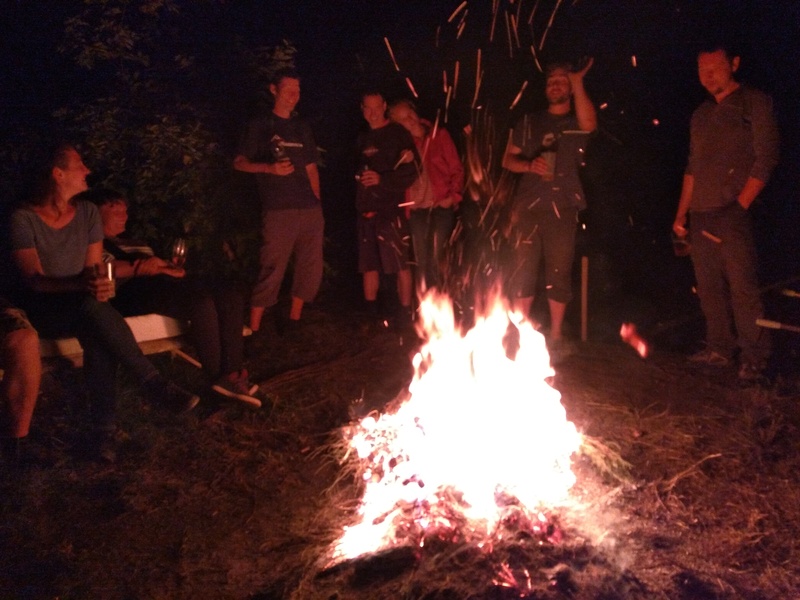 During this expedition in Bohemia, somewhere during the month, I was reminded of how animism, the foundational principle of all religion, is surprisingly difficult to put down. I rejected the Christian Doctrine of Original Sin when I was sixteen. In my late twenties and early thirties I rejected the so-called ‘Laws of Magic’ (well, such as they were widely understood in the neo-pagan community at the time; see my book ‘A Pagan Testament’ for a list of them). Yet this year, events reminded me of why animism is such a persistent, elemental experience. It could start with the simple and perhaps uncomfortable feeling that you are being watched, when you know you are alone. It could come from the more numinous and ecstatic feeling that arises when looking at the dome of the stars from the top of a hill, where the field in which I sat suddenly seemed like the centre of the universe. I remain convinced I was logically and ethically right to reject those religious doctrines I mentioned above. Yet animism, as the simple proposition that the things of the natural world are in some hard-to-express manner alive and spiritually present, seems to offer itself despite all objections. I might scientifically understand everything there is to understand about a flower– its biology, its niche in the ecosystem, the structure of its cells, the chemistry of its life-processes, its role in humanity’s arts and culture– and yet the question seems never to disappear: what if there’s something more to this flower? What if there’s a spirit? And what might that spirit be? Glory of the sun, touching the horizon. Depth of the hollow hedgerow, passage to the mysteries of Earth. Well, there’s a topic for a future book, maybe. But if I write that book, mind that it will not be an exercise in validating anyone’s feelings. Not even my own. I’m a philosopher, and it is the philosopher’s duty to seek the truth, whatever it might be. 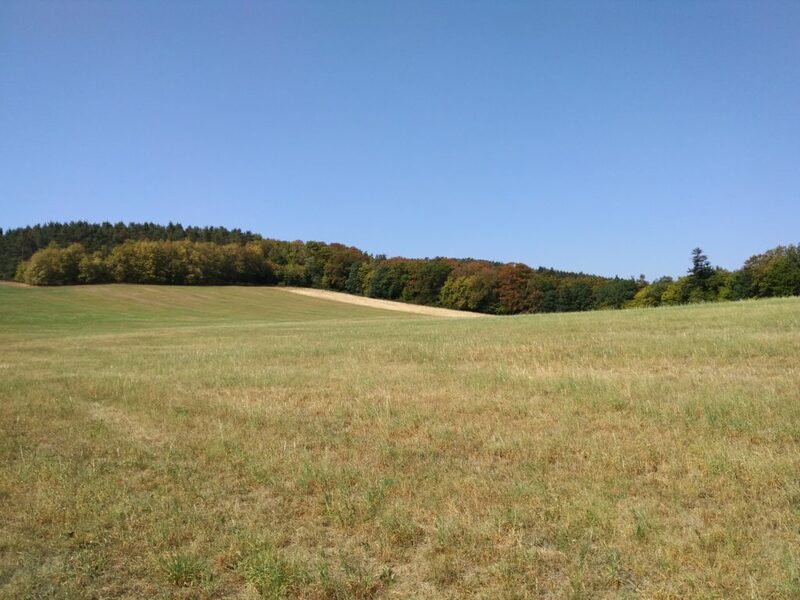 One of the things I love about visiting central Bohemia is the explorability of the land. 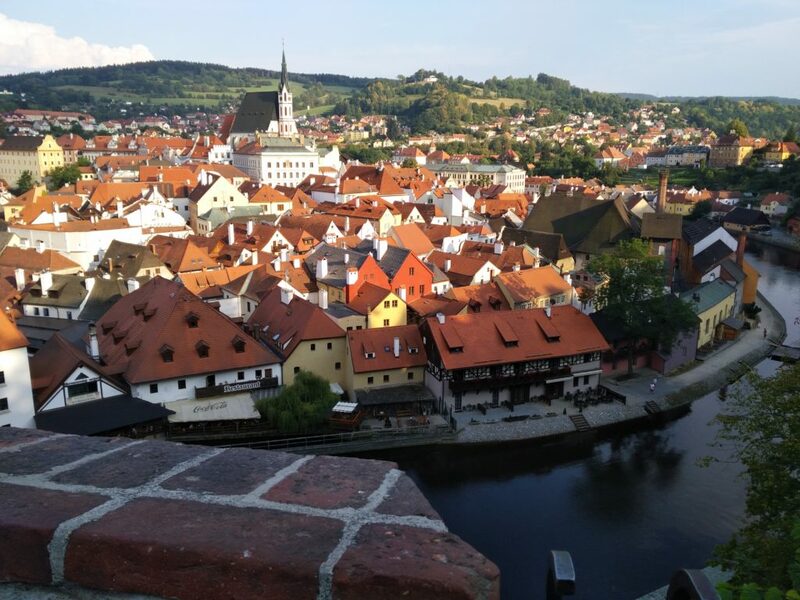 The village is nestled in a shallow valley of meadows and forested hills, and near to a steeper valley which beds the Vltava River. 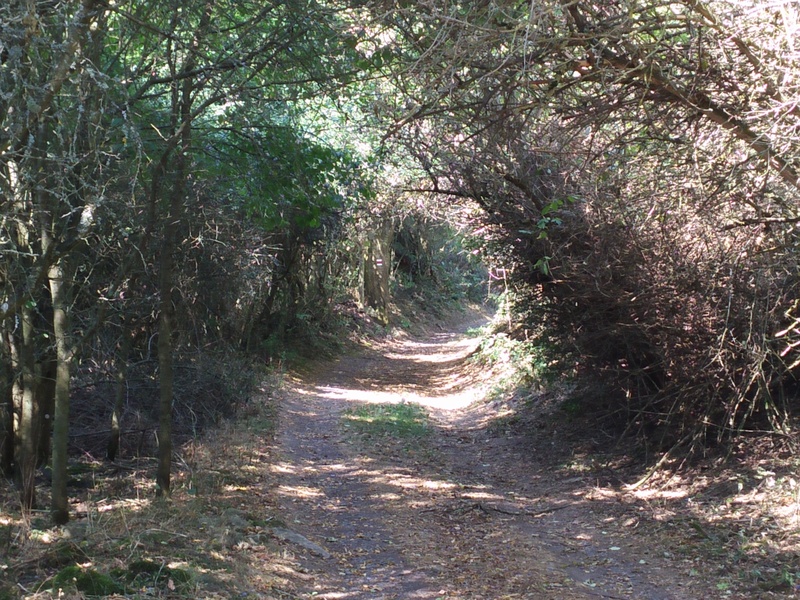 I have come to love walking the trails and hill crests and cave-like hedgerows, with Helli keeping me company and watching out for whatever may lie ahead. I adore these meadows, these forests, these hills. And this wolfdog. This year I did something I hadn’t done (much) in the previous visits: explore the hill trails by night. Since I am writing a novel about Urania, and since the village is far enough from the nearest big cities that the Milky Way is visible on a clear night, I thought it important to go out and see the stars. And so I did– and the planet Mars, too, which was in a leg of its orbit that brings it close to Earth, so on most nights I saw it very bright, perhaps outshining Venus. 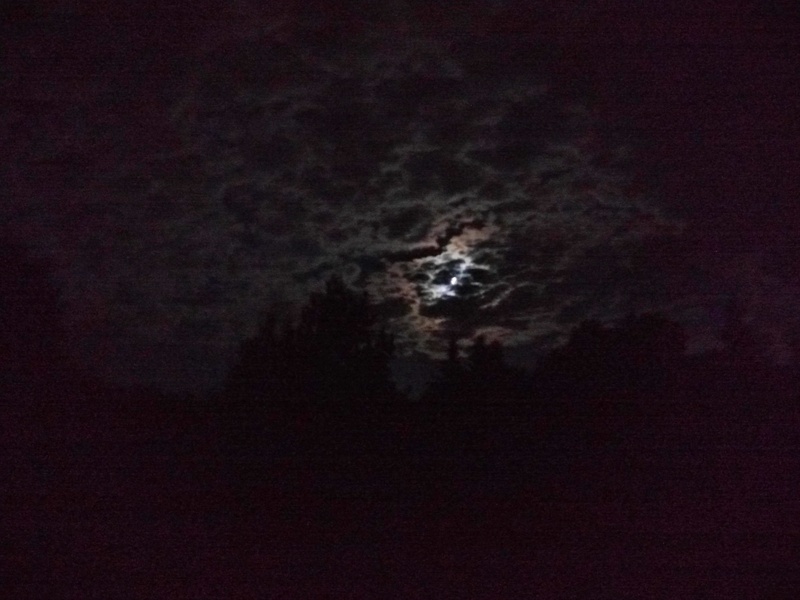 The moon, and the night-glowing clouds. But (you knew there was a ‘but’ coming) Europe was under a protracted heat wave, and had been since Easter. Daytime temperatures never went below 33 degrees C, the whole time I was there; and it rained only once. The grass in the meadows browned, and crackled underfoot. The trees withered too, as if autumn was upon us. The land was suffering. And I veritably mourned to see it suffer. Parched soil and starving trees. I have agreed for years that climate change and global warming really is happening. I wrote my doctoral dissertation about it. I’ve seen the evidence with my own eyes, decades ago. Nevertheless, to see it come to this land that over the last four years I have grown to love– heartbreaking. 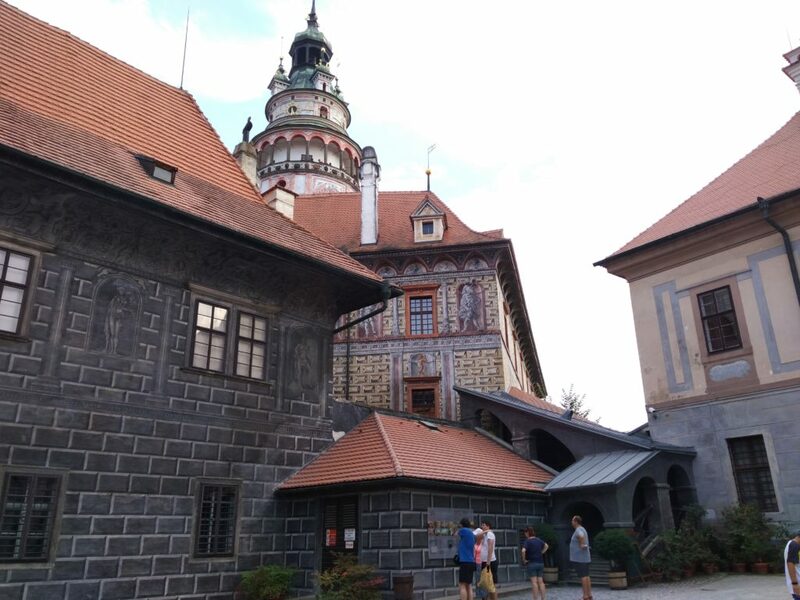 Castle courtyard, Cesky Krumlov. Notice the allegories of the Platonic virtues painted on the building. 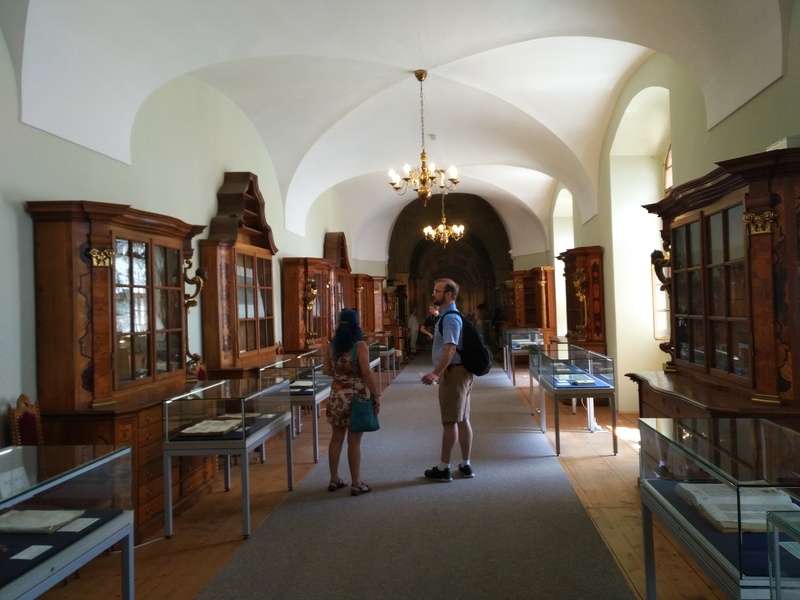 Hall of Curiosities, Strahov Monastery, Prague. 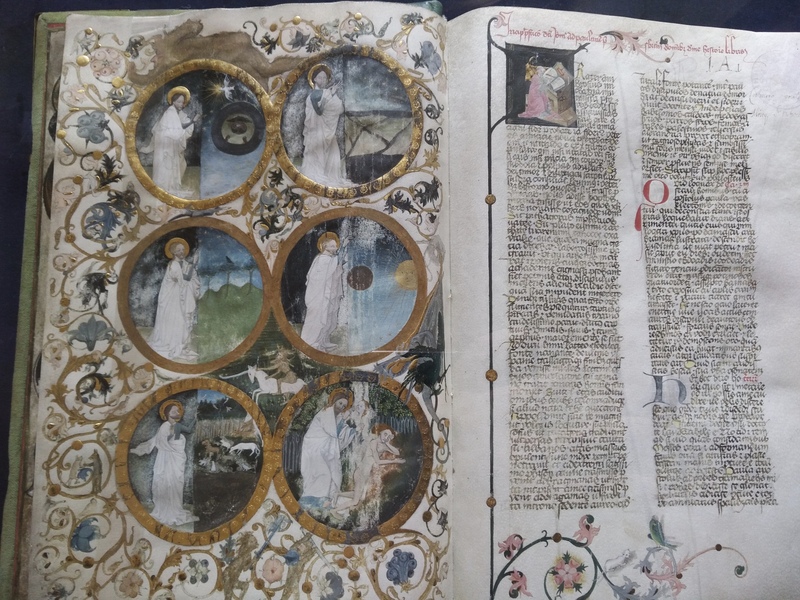 Mediaeval book displayed in the library of the Strahov monastery library, Prague. 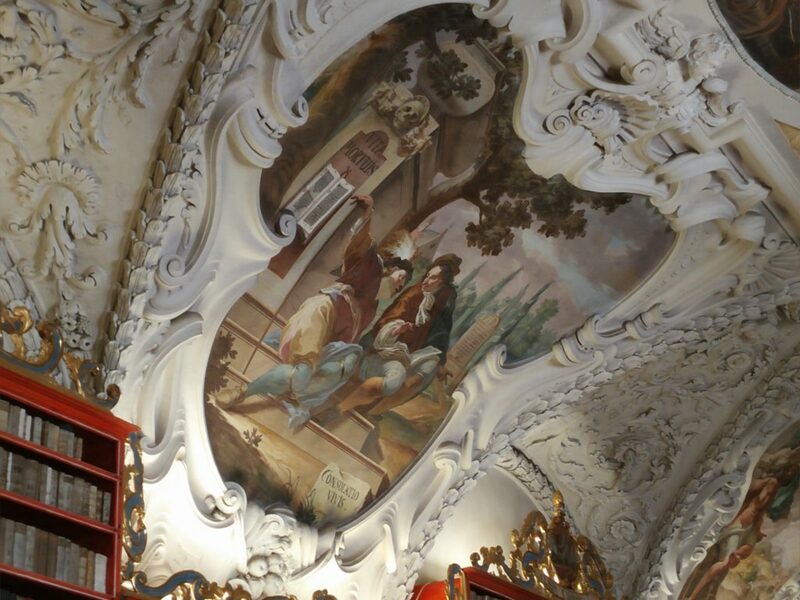 Baroque ceiling ornaments, Theological Library, Strahov Monastery. Postscript. I used to say I wanted to build a temple. 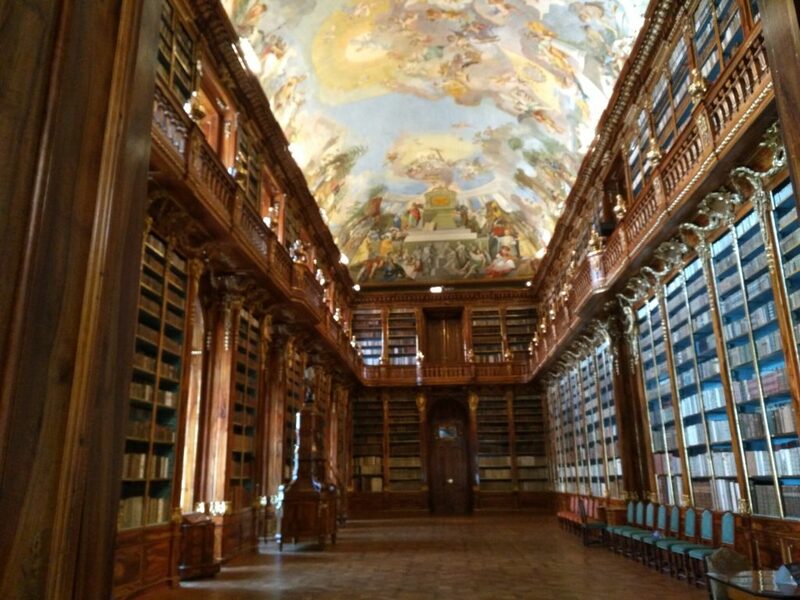 Not anymore– now I want to build a museum (a ‘home of the Muses’) and a library, like this one. And I will fill it with the best philosophy, literature, poetry, music, art, foodways, handicrafts, history, science– everything you’d need to rebuild after a collapse of civilization. My library at home is now almost a thousand books, so I’m getting there.